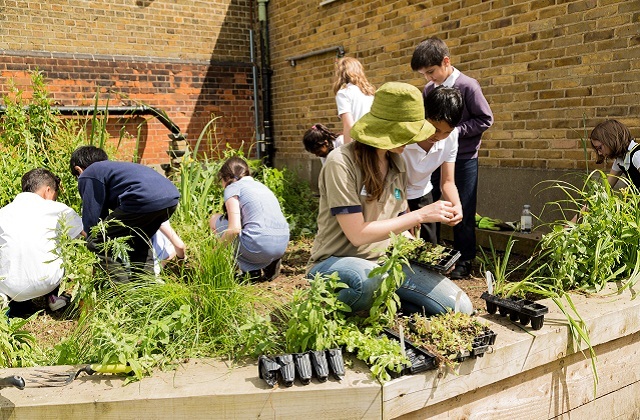 Andy Graham, Head of Community Working Wetlands at the Wildfowl and Wetlands Trust writes about SuDS for Schools, a project to get children enthused about reducing flood risk. Looking to the future, it’s possible to feel down: more and more people live in cities, wildlife is in decline, and there are larger and more frequent downpours of rain. However, there is help at hand: Sustainable Drainage Systems (SuDS) help to manage the risk of flooding. Sadly, SuDS are not widely known about yet, despite being an effective tool to help manage to urban flooding. So, when the Wildfowl and Wetlands Trust (WWT) came to thinking how to make SuDS mainstream in the future, it became obvious that we needed the help of the next generation. And so, SuDS for Schools was born. WWT loves the SuDS concept because it mimics the way wetlands hold back water after rain and release it slowly. It reduces the rush of water into our streams and brooks after a downpour, which can cause flooding. And it means less pollution is washed into our waterways, keeping them cleaner. But, done well, they can be great for wildlife and lovely places for people to enjoy. SuDS for Schools has been supported by the Environment Agency and Thames Water and together we have built SuDS at 10 schools. They're all in North London and the rain that falls on their roofs and grounds all ends up in the same brook - Pymmes Brook. Each school is different in terms of size, the space and the buildings. So each SuDS is unique. But they all capture rainfall, keep it out of the drains and slow the flow into Pymmes Brook, keeping it clean and safe. They've also all become a great feature of the school grounds, appreciated by pupils, teachers and parents. We took the same approach for each. We involved the kids and the teachers in designing them. This was crucial to making sure they were appreciated in the future. We found out where puddles meant kids couldn't play after rain. We found out where they got muddy from taking shortcuts across the grass. We found out what they were studying in their curriculum, and we put it all together and came up with ideas that would make their school grounds more pleasant places to play and learn. Across 10 schools we've directly worked with more than 1,000 kids and 200 parents. Through them we've had the chance to reach far into the community and create a real buzz about the potential of SuDS within the wider landscape. We've also been able to demonstrate to the local authorities and other public bodies the real potential of SuDS. Those kids have helped plant over 5,000 wetlands plants of over 50 native species which have been attracting frogs, newts, butterflies and dragonflies. We've trained the teachers to give them the confidence to use the SuDS to bring their teaching to life. Whether it's science, maths or English, kids are now spending more time learning outside, reconnecting with wildlife. And, what's more, these children are growing up knowing the natural way to manage water. Now that's a more positive outlook for the future.